Put those tight spaces to good use with one of our Double Sided Slim Bin displays. 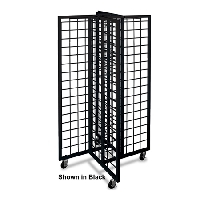 With two sizes of baskets included, the floor display will allow you to exhibit a variety of retail materials. You will receive eight baskets in all with four measuring 12-inches by 4-inches and the other four measuring 12-inches by 8-inches. Use for anything and everything from small hardware products to novelty items. Select the finish of your choice that best fits your needs. We offer black and white finishes to choose from. Minor assembly is required before you can advertise your materials. 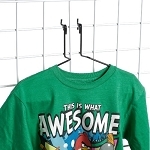 Whatever merchandise you need to display, this double sided display is the answer. Make the most of the space you have and your customers a chance to see what you got. Place several slim bins thru out your retail store wherever you need a little extra display room. Order your freestanding floor fixtures today at this wonderful wholesale price.